Middle-earth is shadowed by the threat of war as the powers of Sauron gather in Mordor. Families are torn apart and people are left without homes, but hope is far from lost. As long as there is darkness, there will always be heroes who stand against it and fight to preserve the bonds of community and kinship. In The Wilds of Rhovanion, the latest deluxe expansion for The Lord of the Rings: The Card Game, you and your band of adventurers are tasked with protecting and resettling a group of Haradrim refugees seeking asylum in the Wilderlands after they defied the rule of Mordor. After all you have seen on your adventures, the task may appear simple. But you have not traveled this way for many years and the land has changed as much as you. (The Wilds of Rhovanion, 36) and begin their journey. This land, once familiar, has become treacherous. Trolls, Goblins, and other evil creatures roam the Vales, and even old foes have returned for revenge with power sevenfold. The land is no longer safe. If you survive the first length of your journey, “Lost in Mirkwood” draws you deep into the woodland where you first began your adventures in the Core Set. Since your last passage, the dark influence of Dol Guldur has increased and can now be felt throughout the mist-choked, labyrinthine forest. The difficulty increases as you desperately search for familiar landmarks, unable to advance your quest until you reach key Objective locations. What you find shall determine where you go. There is no telling where you’ll end up. If you are to survive these perilous adventures, you will need as much guidance as you can find. 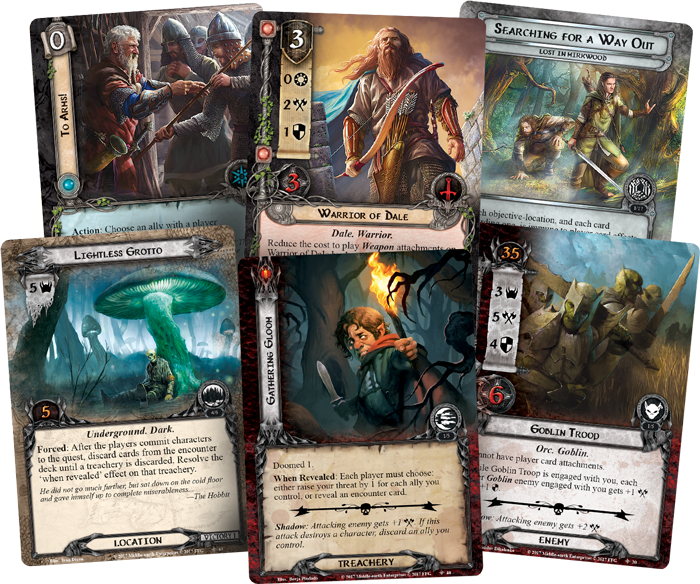 Today, we meet with designer Caleb Grace to preview The Wilds of Rhovanion, the newest deluxe expansion for The Lord of the Rings: The Card Game, which is now available for pre-order at your local retailer or on the Fantasy Flight Games website here! 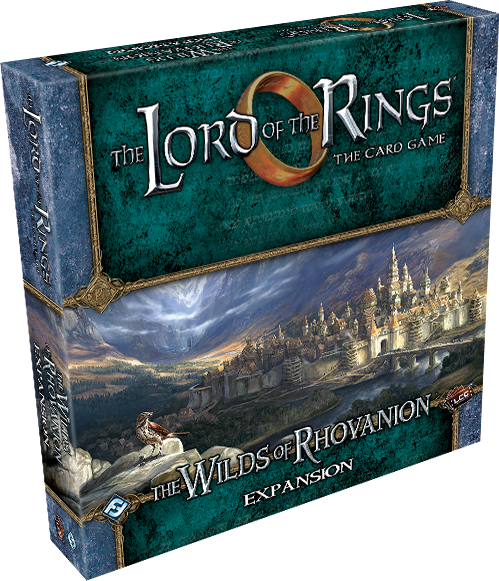 Fantasy Flight Games: How does The Wilds of Rhovanion fit with the latest cycles of The Lord of the Rings: The Card Game? 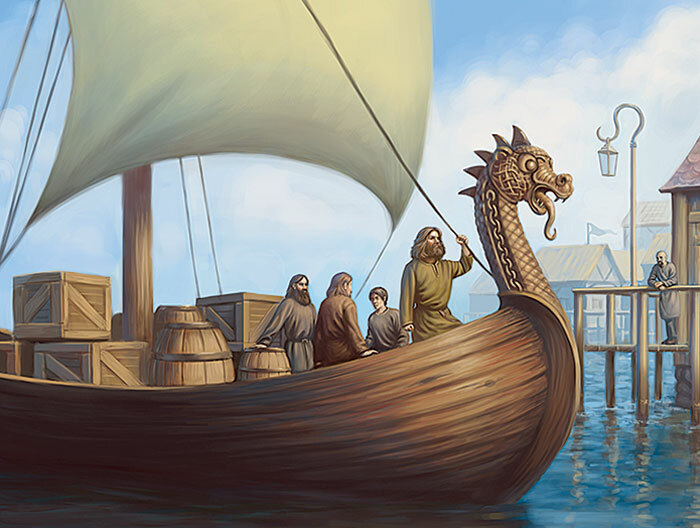 Caleb Grace: Three years ago, when The Lord of the Rings LCG® design team was discussing the future of the game, we made the decision to explore some of the lesser-known parts of the world that J.R.R. Tolkien created. It was a thrilling time to be a part of The Lord of the Rings LCG design team. We were mapping out two years of content that would take players far from the Middle-earth that they were used to and into places most of us had never explored in our imagination. But we also knew that at the end of these adventures, fans would be ready to return to a more familiar setting to enjoy the things that first brought them to this game. 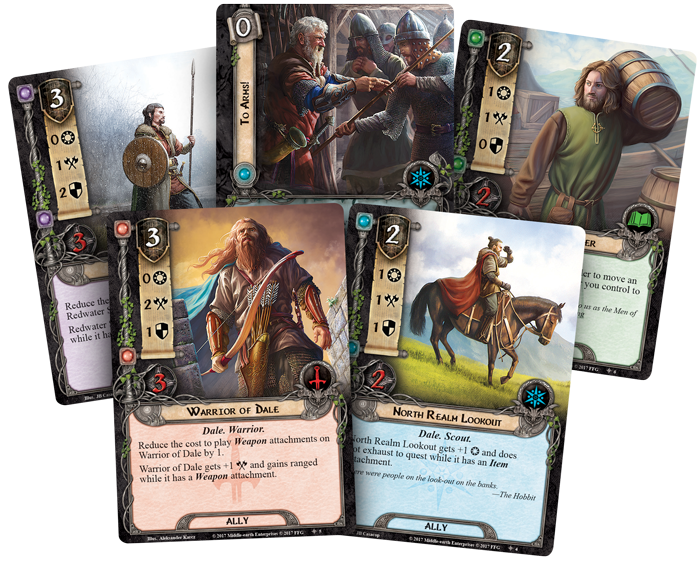 After years of sailing and desert-crossings, The Wilds of Rhovanion is more than just a search for the Haradrim’s new home; it is a homecoming for all of our The Lord of the Rings LCG fans. FFG: The Haradrim cycle took players to the southernmost reaches of Middle-earth. Where does The Wilds of Rhovanion pick up? FFG: The first two scenarios in The Wilds of Rhovanion pay homage to two of the scenarios found in the original Core Set. Why did you want to revisit “Journey Down the Anduin” and “Passage Through Mirkwood”? CG: Revisiting previous encounter sets is something the design team has wanted to do for a long time, and the story was bringing us back to the same region as two of the Core Set scenarios. 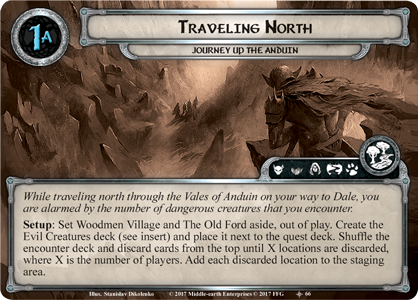 Once again, we would be journeying along the Anduin and trekking through Mirkwood, so we knew this was the ideal time to reexamine those encounter cards. I think we came up with some really fun ideas as a result. FFG: Are there any new deckbuilding opportunities that you’re especially excited for? CG: Definitely! The Wilds of Rhovanion introduces a host of new player cards themed around the Dale trait, and they can be combined to make a solid deck right out of the box. Developer Matt Newman even went so far as to build a Dale deck with just cards from The Wilds of Rhovanion and its following cycle during testing, and it worked really well. What makes the Dale trait unique is how they reward you for playing attachments on your allies. (The Wilds of Rhovanion, 1) raises the willpower of each of your Dale characters with an attachment, and he lets you draw a card when you play an attachment on a Dale character without one. That helps offset the drawback of relying on attachments to activate your allies’ abilities. (The Wilds of Rhovanion, 2) also helps fuel the deck by allowing him to pay for Item attachments of any sphere. That ability alone vastly increases the number of attachments that you can include in your deck, and his second ability allows you to reclaim some of those attachments when a character you control leaves play. FFG: What was your greatest challenge when designing The Wilds of Rhovanion? CG: When we started developing The Wilds of Rhovanion, there were over 100 different playable scenarios in the game, each with a unique hook. We have to reach that much deeper and think that much harder to create something innovative for each new adventure. When faced with this type of challenge, the temptation is to bend and stretch the core mechanics of the game further each time, but we’ve found that the most enjoyable scenarios are often the more straightforward ones that offer lots of replayability. So, our goal with The Wilds of Rhovanion was to come up with adventures that felt fresh without overburdening players with new rules. I think we did just that, and I think players are going to really enjoy what we’ve made. FFG: What are you most excited for players to experience in this deluxe expansion? CG: I’m excited for veteran players to enjoy revisiting Wilderland and to see how far the game has come since the Core Set was first released in 2011. I think players are going to really enjoy seeing old encounter cards made new again in their scenarios, and I think they’re going to have fun with the new mechanics we introduce in this box too. I’m also excited for new players who choose to pick up The Wilds of Rhovanion as their first deluxe expansion. The new player cards in this expansion make it easy to build a strong deck around the Dale trait and attachments, and the new adventures are fun and challenging. With this gathered reconnaissance, you are prepared to journey into the Edge of the Wild and embark on an adventure that is truly your own. Assemble your band of heroes, protect your Haradrim allies, and earn them a new home in The Wilds of Rhovanion! Pre-order The Wilds of Rhovanion (MEC65) today at your local retailer or on the Fantasy Flight Games website here! The copyrightable portions of The Lord of the Rings: The Card Game and its expansions are © 2011 – 2013 Fantasy Flight Publishing, Inc. The Lord of the Rings, and the characters, items, events and places therein are trademarks or registered trademarks of The Saul Zaentz Company d/b/a Middle-earth Enterprises and are used, under license, by Fantasy Flight Games. Living Card Game, LCG, LCG logo and Fantasy Flight Supply are trademarks and/or registered trademarks of Fantasy Flight Publishing, Inc. All Rights Reserved to their respective owners. « I’m Not Doing “Get Help!